Contributing to projects hosted on github: a step by step howto, and an illustration with Marlin (3D printer firmware). Git is powerful... and very painful the first time! / Github contribution howto / Tweaking Marlin for better 3D printer menus. Git mess, only partially resumed by Oliver Steele. as seen on this other bigger, clean and useful cheat sheet. I eventually wrote a feature to fix something that annoyed me for years: allow multi-line commands in the LCD menus of Marlin, a very well known firmware for 3D printer. I needed it for my Delta printer: these printer do require precise calibration, often with a sequence of gcode commands (check the end of this post for more and why I wanted these to be in my menus and not as initialization files on all my SD cards nor on a PC over a USB cable). Now, Marlin is hosted on github, a community front end to many other open source projects. Actually, the linux kernel itself is developed with git so it works, for sure. 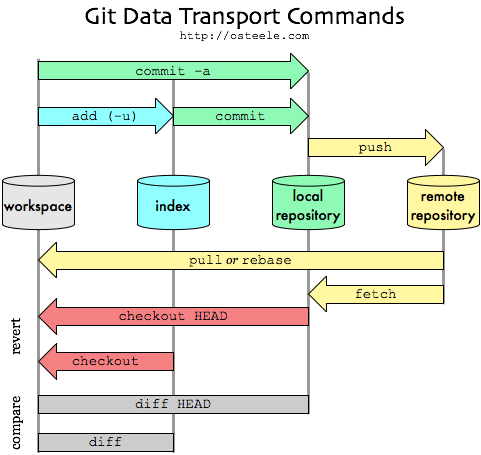 I often tried to use github, but I never went past a simple git clone of a repository. It was still better than to download a zip archive, because you can easily get the new stuff with a git pull. But here and partially out of curiosity, I wanted to try and contribute to a project at the source. Now... what a huge and painful procedure just to give a hand! Seriously, it is mind boggling how much crap and megabytes need to be handled just to help and submit a few dozen f*king lines of code to an opensource project hosted on github. This is too bad since I am sure many programmers would be glad to give a hand to project they stumble upon (like me, often), but without this need to become administrators of complex and shared projects themselves! This article is all about posting and contributing to a project hosted on github. You'll get the calibration g-code line I used at the end of the post if you really ask yourself.